I thoroughly enjoyed reading this story and fully recommend it. Alissa Callen described the people and places so well that I thought I was right there with them. Loved it! Her Big Sky Cowboy by Alissa Callen is a fantastic read. Ms Callen has delivered a well-written book. I adore the characters in this book, they are a perfect fit for this story. Trinity and Zane's story is packed with drama, humor and spice. This is a fairly quick read, a great choice for those with little time for reading. 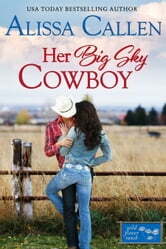 I enjoyed reading Her Big Sky Cowboy and look forward to reading more from Alissa Callen in the future. Her Big Sky Cowboy is book 3 of the Wildflower Ranch Series but can be read as a standalone. This is a complete book, not a cliff-hanger.